Compuware and Sonar Source are working together to change how application quality is addressed on the mainframe. Learn how an integration between Compuware Topaz, Compuware ISPW and SonarSource gives you an accurate, unified view of unit testing code coverage and code quality metrics across all platforms. 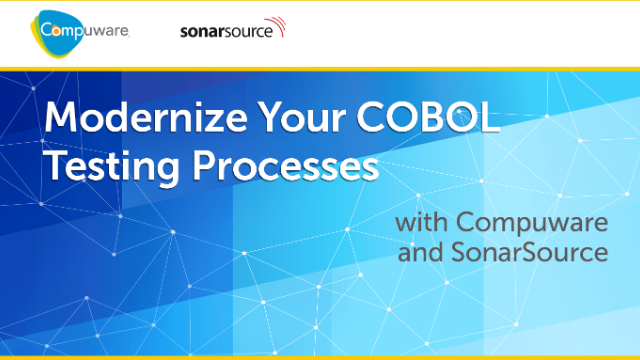 This will help you accelerate delivery, improve quality, increase maintainability and close your COBOL skills gap. SonarQube continuously analyzes source code for bugs, code smells and security vulnerabilities and displays the results along with other quality milestones in project dashboards for continuous code quality assessment. Working in conjunction with Jenkins, the SonarQube integration with Topaz for Total Test enables test pass/fail results to display within SonarQube for code quality analysis. Test metrics can be used in SonarQube Quality Gates to determine whether to proceed with a workflow or stop and fix code before continuing. The integration means organizations can build a mainframe CI pipeline that can be triggered automatically every time a developer promotes their code. That pipeline can automatically trigger unit tests and collect code coverage metrics that can be feed back into SonarQube to verify that the code meets the quality standards defined in the quality gate, before moving it higher into the lifecycle. It’s critical to have this type of quality gate in place so that you can manage code quality and get feedback to developers as soon as possible. There are generations of talented developers whose extraordinary skill, creativity and passion can dramatically transform your business. But if you run your business on a mainframe, they might not be able to help you—unless you give them the tools they need to nail the new realities of their job. See how Compuware Topaz brings developers out of an onerous waterfall environment and provides a modern experience that empowers them to apply their skills to the mainframe and keep your organization competitive. As experienced mainframe personnel retire, next-generation developers must have access to tools and capabilities that enable them to manage mainframe programs with the same level of confidence and quality as other languages. Topaz® for Total Test, Compuware’s automated testing tool, enables developers and testers at all skill levels to test programs and subprograms almost immediately after updating a piece of code to ensure unintended changes weren’t introduced into the codebase. Topaz for Total Test uses data virtualization to simplify test data management and can be easily integrated into a DevOps toolchain to automate testing within the Jenkins automated build-test-deploy process. It reduces dependency on the specialized knowledge of mainframe veterans by empowering novice developers to immediately validate mainframe code changes with the same speed and confidence as other code. Developers can make large mainframe code changes with confidence to make, knowing their codebase can be tested to maintain good quality. Your organization can empower teams to put code changes into production more quickly to better respond to changing business needs. Have you been reluctant to change your Source Code Management (SCM) system because it’s too risky? For Compuware ISPW customers, our migration process helped them switch and they found the grass to be greener on the other side. In this webcast, you’ll hear their stories. We know migrating away from an entrenched mainframe SCM system is daunting. Our customers have massive amounts of code in their SCM systems and numerous active development projects that cannot be disrupted. They also lack both in-house expertise in SCM migration and headcount to spare for large migration projects. Leveraging 24+ years of experience, our team of experts in SCM migration, with their proven methodology and state of-the-art migration tools, seamlessly migrate customers to ISPW.The Compuware ISPW SCM Migration Service is a customized solution for organizations migrating from CA Endevor, CA Panvalet, CA Librarian, Micro Focus/Serena ChangeMan, IBM RTC as well as homegrown systems to ISPW SCM. This service is designed to quickly and economically take you through all the steps of your migration—from project planning, data migration and integration to testing and knowledge transfer. Our methodology and infrastructure provide a single, lighter, more robust and agile SCM environment. Compuware is changing the way developers develop. Learn how our products fit into a unified DevOps toolchain enabling cross-platform teams to manage mainframe applications, data and operations with one process, one culture and with leading tools of choice. By mainstreaming your mainframe, the mainframe becomes just another platform, where any developer of any skill level can build, analyze, test, deploy and manage COBOL applications with agility, efficiency and precision.